Pain in the back, particularly lower back pain, affects most people at some stage in their lives. 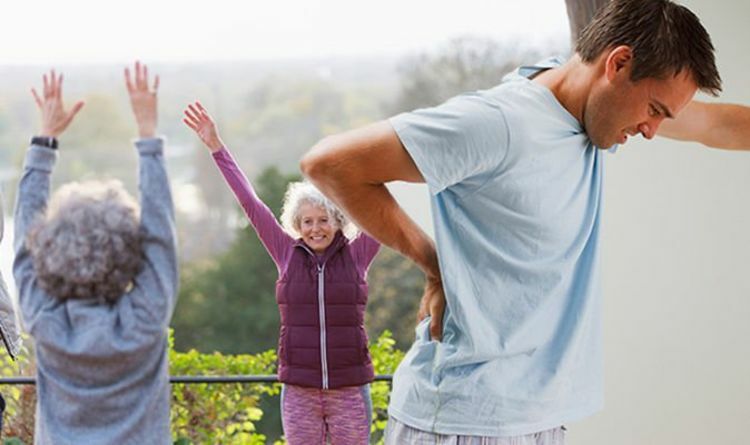 According to Bupa, one in three people in the UK will experience back pain every year. Back pain isn’t usually caused by anything serious and normally improves within a few days, weeks or months, depending on the severity and cause. However, it can be extremely uncomfortable and frustrating to live with, getting in the way of completing daily activities. While it may seem tempting to keep the back still if you have back pain, it’s actually important to keep it moving gently as much as possible. This is because exercising and keeping the back active will strengthen the muscles and increase flexibility, in turn helping speed up the recovery process. Kneel down on one knee and bend the other leg so your foot is flat on the floor and away from the body. Lift the back knee up slightly off the ground and hold for five seconds. Repeat three times on each side. Standing up, bend one leg up behind you, holding your ankle with one hand. If necessary, hold on to a chair or the wall with the other hand for support. Hold the position for five seconds and repeat three times with each leg. Lie on your back and place your hands above your head. Bend your knees and roll them slowly to one side, keeping your feet on the floor. Hold the position for 10 seconds and repeat three times on each side. Lie on your back with your knees bent. Bring one knee up and gently pull it towards your chest for five seconds. Repeat up to five times on each side. “Being active and exercising won’t make your back pain worse, even if you have a bit of pain and discomfort at first. Staying active will help you get better,” said Versus Arthritis.